audrey is due in like 2 weeks. she is HUGE. she's about to explode. are you having twins?! oh my gosh, did you swallow a watermelon! i just thought i would say all that because it's what every pregnant woman wants to hear. NOT. stop saying this people. do you like people commenting on your body changes? no, neither do preggars. audrey actually is pretty pregnant. the things she says when she's prego, not so much. but we don't live in a perfect world...sigh. red and white striped fabric...left over from layne and penelope's room. from ikea. 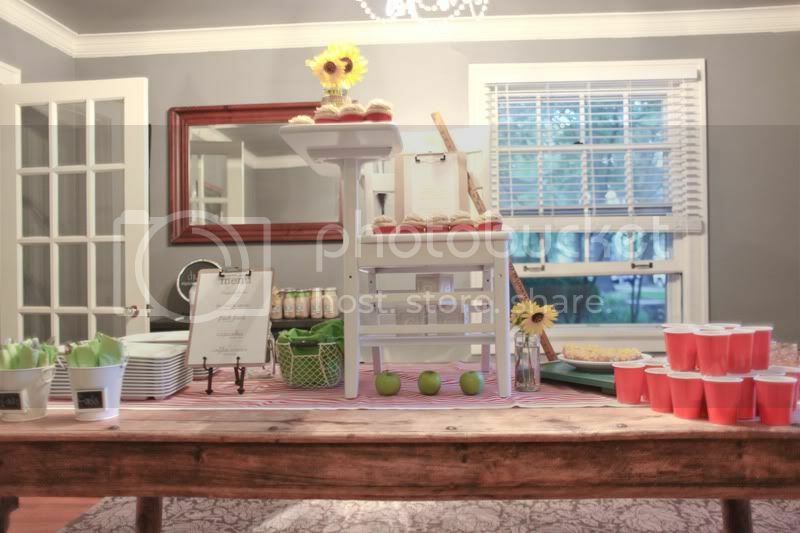 i can't stop putting chairs on the tables(remember this baby shower?). we got this orangee-wood desk from a flea market and my dad painted it white. anyway, the cupcakes sat upon this desk. i'll let you guess what auj is naming her babers. a little pennant spelling "june". i just printed some letters out, cut circles and pasted them on some paper bag paper. and the triangle part is writing paper. 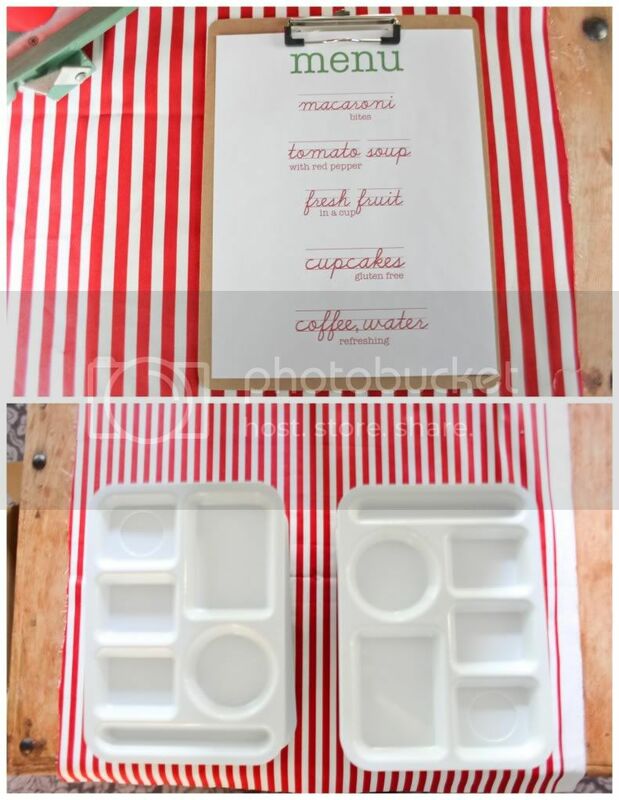 and yes, we bought some school trays on the intranet. i mean, they are pretty pricey. IF you're only going to use them one time for a shower. but no, my mom had the great idea of using them at thanksgiving too. and i'm going to keep a couple in my cabinets for the kids dinners. they are so fun. 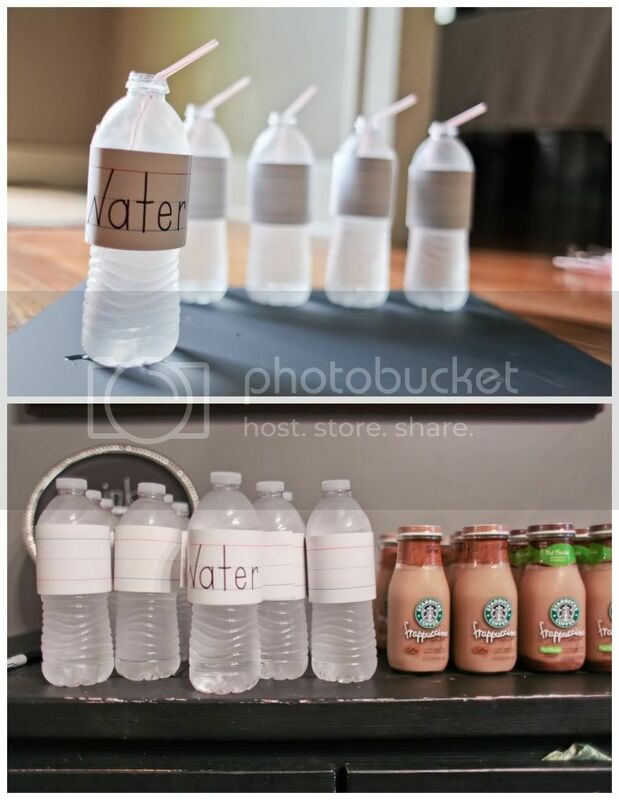 water bottles with writing strips on them. i got these at the dollar store! they are great for writing names on. IF people would follow directions. but some of you didn't...you know who you are. and then little iced coffees just for fun. even though i hate coffee. but aug doesn't. so there. so here are some food pics. sorry about the lighting...it was an evening shower on a cloudy day. enjoy the yellow glare. we set up a long table in the living room for people to sit at. i borrowed these chalkboard placemats from laura. they were at her wedding. which was the cutest. 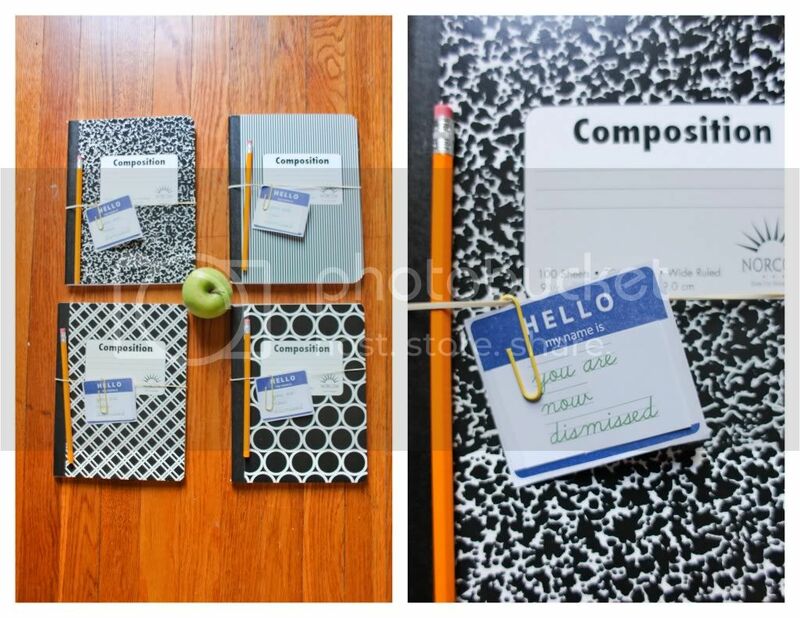 the party favors were composition notebooks with a pencil. 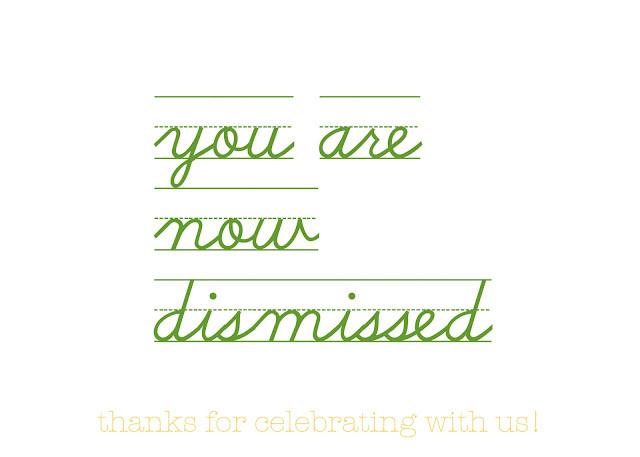 and a name tag with a label saying, you are now dismissed. everyone likes a notebook! 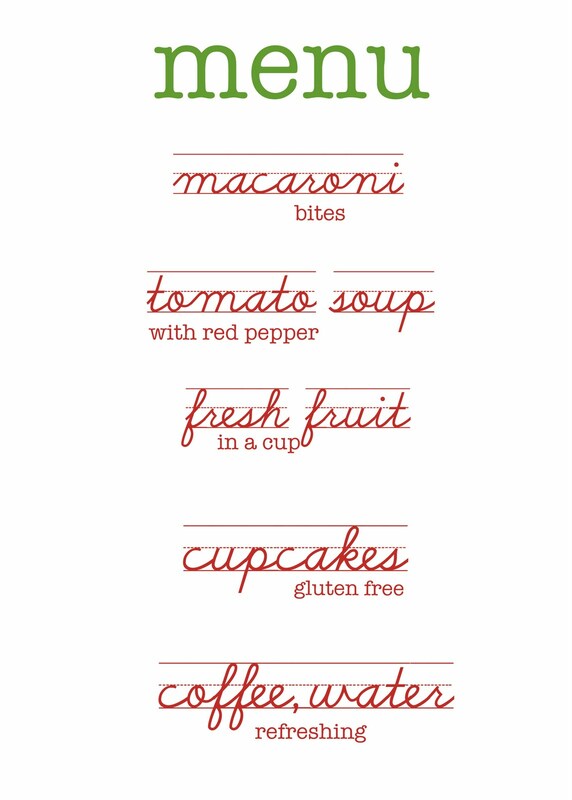 you are welcome to print the menu or favor tags. my mom went ahead a brought some nasty hairnets and gloves for us to wear. as a joke. i think? enjoy. you can see that my mom thinks i'm the funniest person on the planet. which is actually true. audrey took these pictures and she was not laughing. but secretly she was in her heart. anyway, it was so fun to watch open presents for a little girl. this girl is going to throw audrey for a loop. i hope. it is my prayer. ahahahahaha. can't wait to see meet your baby, audrey. did that make you spurt a tear, auj? Dude. 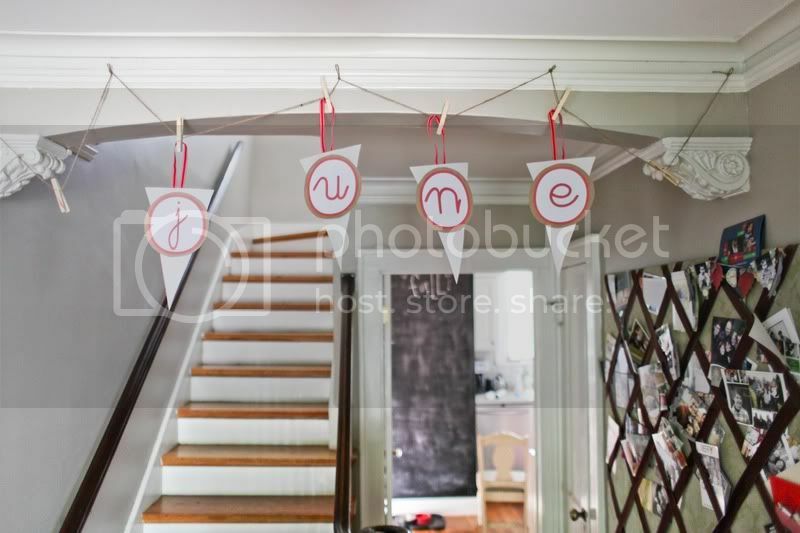 I threw an alphabet baby shower last week with the same handwriting on lines thing. And I forgot my camera, so it's pretty much like it never happened. Spoooooooooky. I have been stalking your blog for a long while now...linked to it from the Littrell's. Every post makes me laugh and/or cry. Though you don't like coffee, so not sure we could be friends...but that is besides the point. I love your craftiness, your honesty, your devotion to God and family. Thanks for blogging. 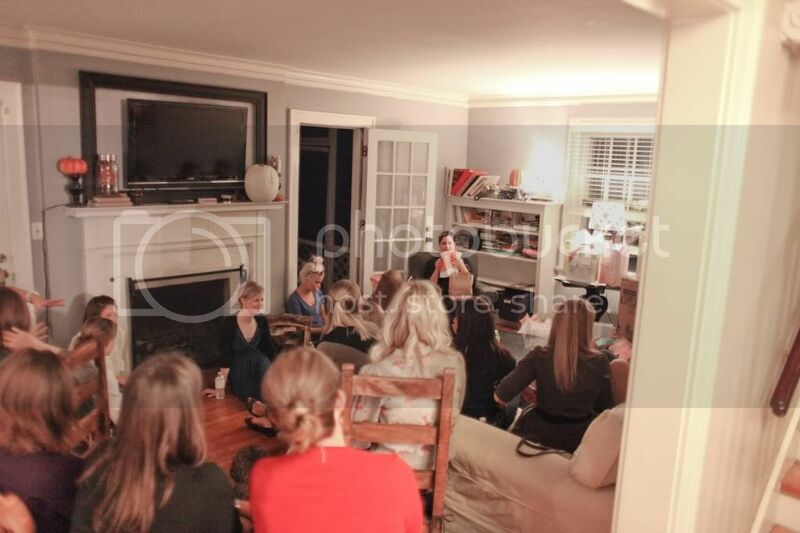 Looks like an awesome party--I always want to steal your ideas! I love this theme (I'm a teacher)! I also have a confession. 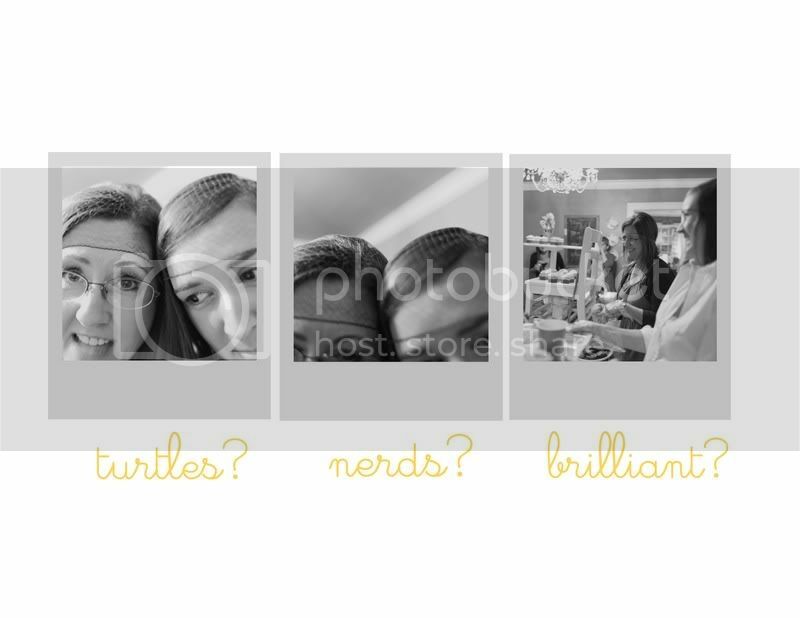 I was following both your blog and Audrey's for a little bit before realizing you were sisters. Yeah. I'm a little clueless. Anyway, great job on the shower! that is nuts. you are nuts. another genius party. don't you think you should have landed your own HGTV show by now? i do. 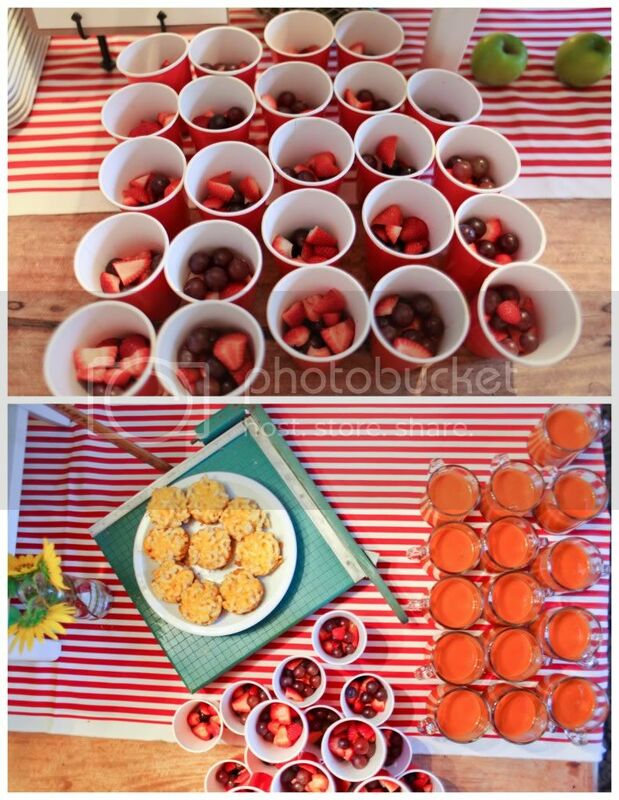 You come up with the best party ideas! So adorable! Martha Stewart who? looks like it was a blast, and what a great theme. love all the details! very very cute. your writing is so funny. Love your blog, so glad I found it. i almost cried again...you biz. i kept it together though. especially after you wished that june will be a naughty chicken. anywho, thanks for throwing me a shower. you are the bestest, coolest, most awesome sister in the world. mazzle mazzle my friend. mazzle mazzle. Oh wow, Jami! I love this!! I'm a teacher (or was before the little man entered my life) and I totally love all the decorations, especially the awesome white desk holding the cupcakes! So awesome!! You're such a good sister, when all my paperwork goes through and I'm your sister as well you can throw me a shower..for when i have more babies. LOTS of them. You should probably start saving now. NBD. freaking adorb.love the name june. The comments people made when I was pregnant with twins were beyond absurd. In their defense, I was a house with legs and a smile. But still. So rude. My favorite was the guy who stopped me in the produce section and smiled and declared, "Twins! You must be having twins!" I smiled back, "Had. Had twins. They are two months old." That day was awesome. In other news, this party is also awesome. 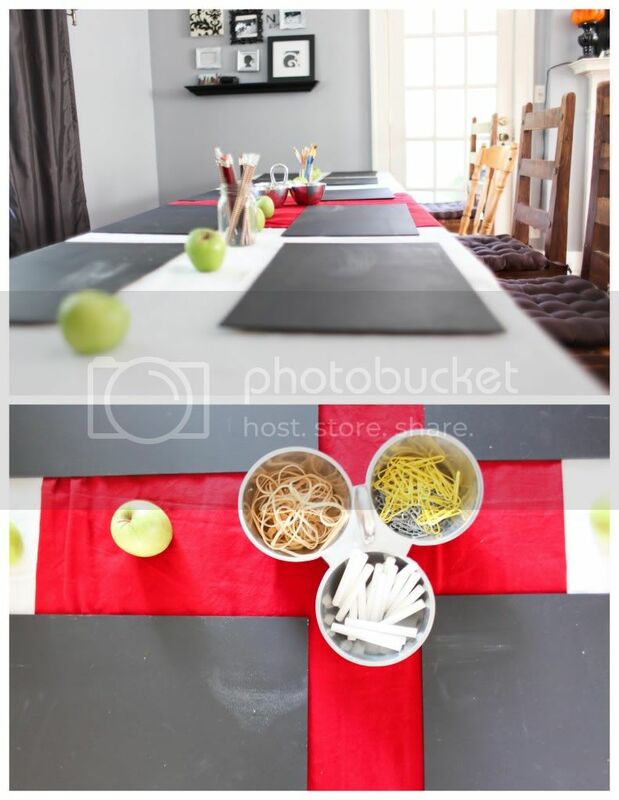 Chalkboard placemats? ARE YOU KIDDING ME. Yes please, every day. So question. 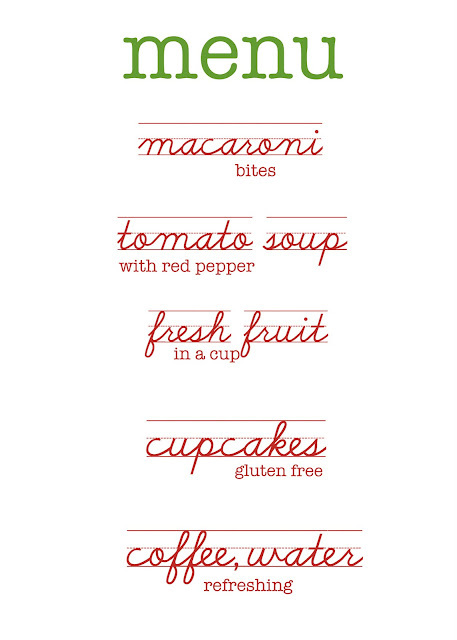 Why gluten free cupcakes? I now have to eat gf because of my celiacs disease... but regular cupcakes are WAY better. Does someone there have to eat gf? zedWife, my mom is gluten free. but i'm not lying when i say this...she has mastered these cupcakes and they are better than regular. NO FREAKING JOKE. like amazing. she has this flour mixture she does. she sends off for 5 different flours...mixes them and the result is sheer magic. everyone was raving about them. she needs to do a tutorial on them for sure. you throw the best showers ever. um ok. 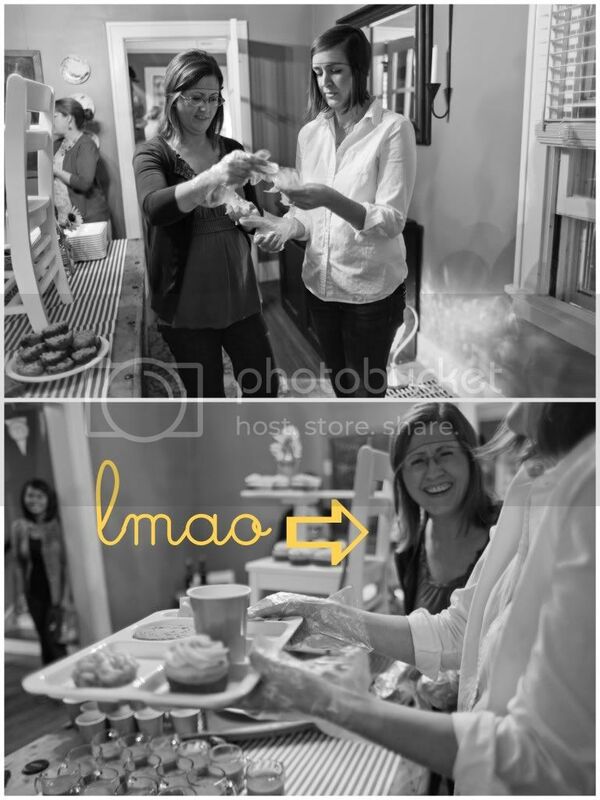 I could not help but relate and give a ho hum at your mom thinking you are the funniest person on the planet. second of all, i totally dig your blog. when i do read blogs, which is a once a month occurance, yours is a go to. Oh my goodness. The sweetest! And I AM a teacher! This shower was super adorable, things like this make me sad being far away! And I too, hope that baby girl is ca-razy and gives Zach and Aud a run for their money! I LOVED that you served the Macaroni Bites off of a paper cutter.... bahahaha! Hope that thing was locked down! Where do you come up with this stuff kiddo? What a delightful shower...thanks for sharing. I wonder, do you know how cool you are? This is seriously the coolest shower. Your friends are lucky gals. SO FLIPPIN CREATIVE! You are the bomb-digity! Love it! AND....YOU LOOK FABULOUS BY THE WAY! Did you JUST have a baby?!?!!?! I DARE SAY SO! I vote for Brilliant. I'm not sure if I've been commenting like a good blog reader, but know that I've been eating your blog up like chocolate cake. thank you for being so darn funny and for your superb testimony. 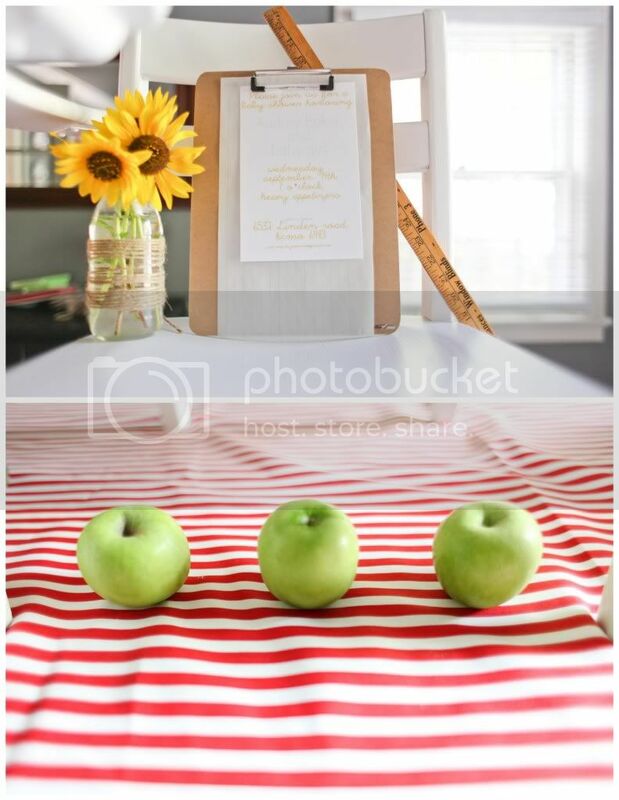 What an incredibly amazing awesome idea for a baby shower. You are amazing. My sister is a teacher and would go wild for this. You could save all this stuff and use it for me when you throw me a baby shower. Or really a wedding shower. Whatev. I love school. I used to be a teacher. And everyday I thank the sweet Lord that I am not one anymore. Amen. Please tell me you gave a spelling test as a game where guests had to spell words like "billirubin" and "colustrum" and "episiotomy". Seriously, Jami??? Will you please stop making the rest of us shower throwers look so bad??? It made me spurt a tear and I don't even know you peeps. Probably a little emo about the face that my hubs and I have been trying to get preggers for over a year with no luck. Also sisters are amazing an I wish I lived closer to mine. That makes me emo too. And I wish and hoe and pray that my little girl will have a sister (or a brother) someday... Now I am really spurting tears, great, Thanks. You throw a bomb party. Lovely lovely LOVELY shower! I have to ask (random, I know), but do you happen to remember the name of the color on your walls? I might be in love with that shade of grey...possibly? Maybe? ?